The nation’s love affair with food and drink on-the-go continues. A recent piece of research from global market research firm Mintel indicates that the on-the-go food and drink market could be worth £23.5billion by 2022. This growth is partly down to innovative menu development, inspired by consumer trends towards healthy foods, with adventurous, global flavours. 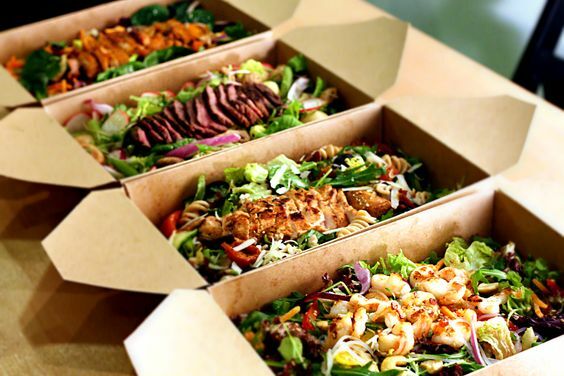 Innovative packaging development and changing menus are turning the food-to-go market into a very competitive arena with food-to-go specialists, like Greggs, Subway and Pret a Manger, set to overtake casual dining restaurants to become the biggest part of the market in the next five years. With rapid growth in the food on the go arena, the requirements for innovative and practical food packaging for takeout food grows with it. But this growth is parallel to the rising concerns on single-use packaging. The EU recently announced in their latest strategy that they will make all plastic packaging recyclable and reusable by 2030. The UK also announced that there will be a ban on all avoidable plastic waste by 2042. Customers are becoming aware of this news and are now looking for sustainable alternatives. Statistics from the is4profit information resource website, reveals that 80 per cent of customers believe it is important for businesses to offer food packaging that is environmentally friendly, more than 20 per cent of those also said they were willing to pay extra for it. 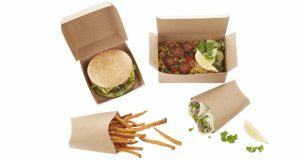 One of the packaging materials that has become extremely popular in the foodservice industry for its environmental benefits is Kraft paper packaging. Kraft paper is made from recycled materials and unlike coloured packaging doesn’t involve a bleaching process. The packaging is often brown, giving a home-spun feel, but it is possible to bleach the paper to get a range of shades from natural brown to pure white. Kraft paper is also stronger than regular paper, due to its reduced lignin content and high sulfur ratio. It also doesn’t involve extensive bleaching, which decreases the paper’s strength and increases manufacturing costs. The process of creating Kraft paper uses all types of wood, including resinous pine and bamboo, which are left out of traditional paper making processes, and because nearly all the chemicals used in the process are recovered and reused, it is a self-sustaining method. 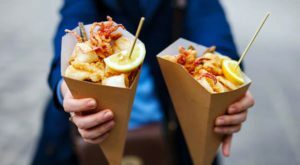 When used in a street food environment, customers like Kraft paper packaging because it gives a natural, organic vibe, which is great for businesses selling locally sourced, seasonal food – with an emphasis on the sustainable. Our supplier KeCo ,based in Cambridgeshire, supplies innovative food packaging solutions, specializing in the convenience food service market. KeCo has released a range of Kraft packaging called Simply Kraft – a complete range of products to suit all needs, with a textured effect which adds a handmade feel, whilst maintaining premium presentation. KeCo offers packaging for sandwiches, wraps, baguettes, salads, and for dishes served in a street food environment, they also offer tapered trays. Our partner supplier Huhtamaki have also responded to the demand for Kraft packaging with the launch of their Relish range. Relish comes as standard in very ‘on-trend’ Kraft brown board, but other options are available. The range consists of folding carton products that can hold a range of hot and cold food – from salads to wraps to pulled pork, and that allow operators to serve food quickly and securely for eating on-the-go. There are initially four new products in the Huhtamaki range – the Relish clamshell, food box and two scoops. All of the products in the Relish range are grease proof lined and made with 100% PEFC paperboard, they are manufactured in the UK and contain recycled content. At Bunzl Catering Supplies, we are actively supporting our customers to make the right packaging choice and to use packaging responsibly. Check out our Sustainable Future 2017 e-brochure and get in touch to find out how we might work together to support your foodservice business.